Many people think that after making dreads all problems with hair disappear as this hairstyle does not demand a lot of work. It would be true if you wanted your dreads look as in real Rasta or Indian somewhere in the middle of nowhere in India. For those however for whom having dreads is not just a symbol but also a style, hair care is an important issue. Some things are not as obvious as they seem so I’ve decided to place here most important information and also describe problems which you may encounter wearing dreads. You think about making dreads but don’t know where to start, let’s see what you can do. Appropriate, minimal length of hair to make dreads is 8 to 10 cm. Out of the hair of this length you can make relatively short dreads which will be circa 6 - 8 cm long. Depending on your vision and needs you may wait for your dreads to grow slowly or you can extend them with natural or synthetic hair. If from the very beginning you plan to extend them you can make dreads out of the hair of 6 – 8 cm long. I will go into details in the further part. What is most important when you make dreads is that the shorter hair the less they curl. For instance out of 15-cm long hair you will make 12-cm long dreads, but out of 50-cm long hair you may expect 25 – 30-cm long dreads. At this length and with longer hair the hair condition is also important – the older hair the weaker and thinner it is so to braid a pretty dread in particular at the end they need to be made thicker. Generally at a medium length of hair the dreads are circa 1/3 shorter than the hair. However type of hair and a technique of making dreads also affect their length. That is why in my opinion if you want to have dreads it is better to make them short rather than wait for your hair to grow. Many people grow their hair to make dreads while actually it is better to make short dreads and wait for the dreads to grow. Firstly, the hair will not get so short. Secondly, you don’t need to wait for your hair to grow long to make dreads – and anyway after making dreads it will be shorter than the hair grown for long. If two people make dreads, one of short hair and one of long hair, after one year the dreads of the person with short hair will be longer. Thirdly, dreads grow quicker than hair or at least you have the impression that they do as their growth is seen immediately and dreads do not scrub the way normal hair does. Fourthly, after a dozen of months hair bulbs get used to a defined direction of growth and majority of hair starts to „dread” itself. A selected technique of making dreads determines appearance of future hair lank. The most natural often called „organic” or „freeform” technique consists in neglecting. Lack of combing and cutting makes hair willing to curl to dread. Such dreads are usually of various size, get together and become thicker and thicker. The method is popular among Rastafarians declaring naturalness. However achieving the goal may turn out difficult with hair which does not curl itself. The method may be combined with backcombing hair with a comb. The next step is their beating down by curling individual dreads in hands. It is best to curl them by placing hands as close to the head skin as possible. A curled dread is to be placed between an index finger and a middle finger so that the inside part of the hand is directed outwards. Between the same fingers of the second hand we put a curled dread and we fold our hands. We make a rotational movement on the palm planes. The method is natural however to get any effect you need to work for it for about 4 months. 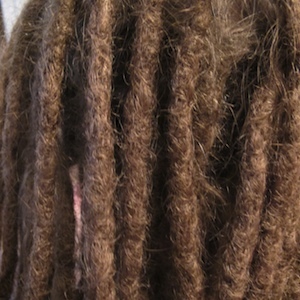 A popular and efficient technique of making dreads is the one with wool. Relatively short hair is chaffed with wool cap, towel or jumper. After several months of work you may enjoy “dreaded” head. The minus of this technique is that you need to wait for several months and the method is efficient with short hair only. 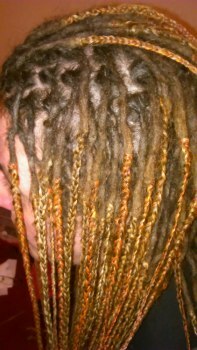 One of the interesting ways of creating dreads is combining synthetic braids with dreads. Instead of taking off plastic hair after three months, because of growing hair, you leave them and the growing hair starts to dread itself. When it has the right length the plaits may be taken off and the dreads finished. The disadvantage of the technique is a long time of waiting for the effect, and the very technique may be attractive mainly for people with short hair. This method though controversial is quick and very permanent. It consists in dividing and backcombing hair into individual dreads and finishing them with fluid for permanent wave. The disadvantage is mainly a change of the hair structure, a possibility of burning hair, lack of a possibility of combing out hair, a possibility of slight waving of dreads. It is one of the most popular methods of making dreads. Divided and backcombed hair is beaten with a crocheting needle pulling wisps inside a dread. This technique is also perfect for curling grown hair and finishing dreads. The technique may be used for each type of hair. The effect is visible immediately and the dreads are long-lasting. After 3-4 months from their making they obtain a structure of a mature dread. The disadvantage of the method is a possibility of exaggerating and if the hair gets beaten (crocheted) too hard it may break and crumble. 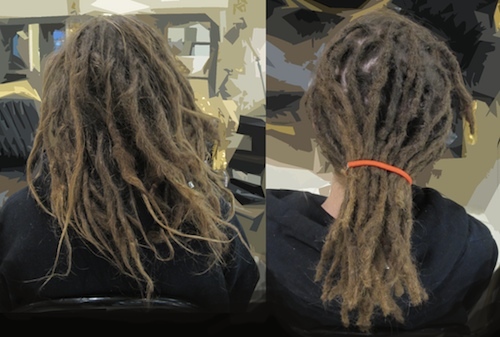 Regardless of the type and technique in which dreads are made, they all need time to mature (from 2 to 6 months). 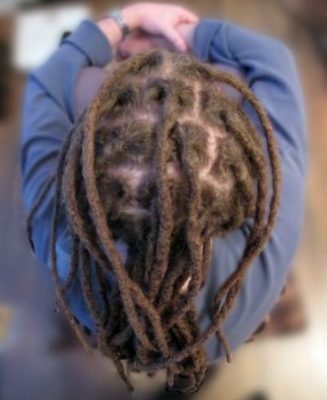 Growth of dreads is a process during which the dreads get beaten and tangled. Dreads are made of clean and dry hair. At this stage except for selecting an appropriate technique it is important to divide a head into individual dreads. It should be done skilfully – further growth of hair in dreads and comfort of wearing depends on placing dreads. At this moment we decide about a thickness of dreads. Choosing more hair means thicker dreads. It is best to do the first dread at the back of the head to see how one’s hair shags and how its thickness corresponds to a dread thickness. If you have thin hair I recommend thin dreads as visually they will increase the amount of possessed hair. If you go for thick ones remember that only at really thick hair the dreads will look good. From my experience I can say that you head will look really good starting from 30 dreads. Fortunately we can always use synthetic or natural hair. They are helpful not only at lenthening dreads but also at their thickening. Once we decide upon the size we can start working. Time needed for making dreads on the whole head depends on a technique, experience of a dread maker and length of the hair. Obviously the longer hair the longer time and amount of work. Thickness of dreads also affects the time – the thinner the more time they need simply as there are more of them on a head. Professionally good dreads are made within 8 to 12 hours, very thin ones even 15 hours. After finishing the work and beating the hair, particularly if the dreads were made with a crocheting needle, one can get shocked. Very often fresh dreads through pulling the hair stick out everywhere. Don’t worry. It’s enough to bind them or at short dreads to cover them with a cap or band and after several hours they will lay naturally. Just after making, dreads are stiff and beaten, with time however they get longer and softer. In dreads we distinguish two types of ends. „Brushes” they are really dreads without ends, a dread becomes normal hair at some point – such ends are from one to several centimetres long and they look very natural. Dreads may also be ended by pulling all the ends inside the dread. If you want to have beads or other decorations in your dreads through which you have to pull your dread, put them on when making dreads – they will stick better and you will be able to fit proper sections of dreads to them. Naturally later on you can also put whatever you want on your dreads. Many people, having their dreads made and also after curling up the dreads feel pain of the head skin. Depending on one’s sensitivity you may feel it more or less. Certainly when dreads are being made hair is pulled and that makes you feel pain which is only natural. Tension and pain may last maximally up to three days after making dreads or curling the dreads up. To make dreads look nice you need to take care of them. 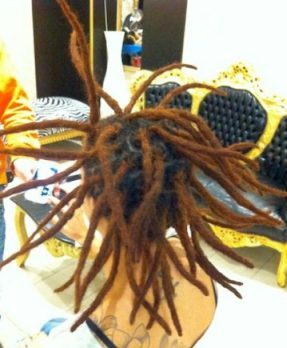 After circa 4 – 6 months from making dreads they become mature, their structure changes and hair gets used to being dreads. Only after this period you can talk about real dreads. Below I will try to present the most important care routines related to this hairstyle and most frequent problems which you can encounter wearing your „lion’s mane”. Quite a controversial issue – dreads are often associated with dirt which is a myth unless their owner really doesn’t care about personal hygiene. How often you wash your hair depends on you only. After making dreads it is recommended to wait with hair washing for about a week, however it is optional. You should really wait with first washing as the process of arrangement of dreads and their gradual expansion take time. If you treat dreads as your dream hairstyle, don’t torture yourself – wash them. This is what I always say to my customers. Of course we all know it is better not to wash your hair on the following day, it is better to wait a while until the hair in the dreads curls up and gets used to the new hairstyle. If your hair is not very stiff you may try to wash it after4-5 days. For new dread owners the worst part is to get used to rare washing and to make the head skin get used to dreads. I don’t recommend hair washing every day as then hair escapes from the dreads and they soon become „hay” and has to be curled into dreads again. It is best to wash your hair every 1-2 weeks initially and after several months skin on your head gets used and hair stops to get greasy. An agent with which we wash our dreads is also important. In general the best shampoo for each type of dreads is shampoo for children – it doesn’t contain any additives – and this is what we want. Hair in dreads is not shiny as in shampoo tv commercials. The more matt they are the better they stick to each other and create a prettier dread. For this reason I personally recommend washing hair with mere soap. I doesn’t have to be any special soap. I use soap in bar – it foams very well and after washing, hair is coarse which makes dreading it easier. Remember to rinse the soap carefully. Soap is not recommended to people with very sensitive skin due to a possibility of occurrence of dandruff – soap dries not only the hair but also the skin. Shampoos for dreads – they are an interesting alternative however except for the price they do not differ much from shampoos for children. An important issue related to hair washing is an absolute prohibition of drying dreads with a hairdryer – hot air makes hair come out of a dread – and hair becomes more shaggy then normally. Drying should be slow, it is best to squeeze the dreads against a towel and wait patiently until they get dry. It is not recommended to wash dreads in the evening as during the night wet dreads get flat under the weight of one’s head. Flattening of dreads is a natural process however it occurs after many years of growing dreads without proper care (curling up). Occurrence of dandruff is a natural reaction of head skin to irritation. Usually after a while it should disappear. If not you should buy special anti-dandruff shampoo to solve the problem. When dreads are made they start growing. After several months first roots appear – undreaded hair going into dreads and loose single hair. It is a natural process of growth of both hair and dreads. When roots look ugly or you really have a mess on your head – dreads start to get together, hair gets out of dreads or simply hair has grown too much – it is time to curl up your dreads. The most efficient method of curling up is crocheting – it enables a dread-maker to curl up the hair not only at the head but also along the whole length of the dread. Using a crocheting needle you can improve its structure, fill up where they get thinner etc. A supporting method of curling up dreads is shagging them with use of a woollen glove or cap – this method shags dreads well, unfortunately it also weaves the dreads together. 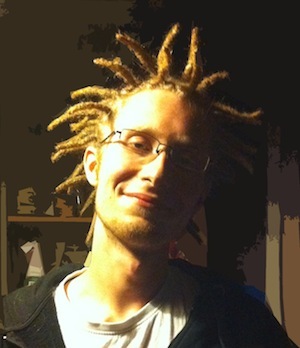 Soon after curling up dreads people worry about a division into individual dreads which is visible on their heads. Not everyone likes skin visible between dreads. Don’t worry – after several days from curling up dreads get loosened. Hair grows a bit and so called squares disappear. This problem is the bane of many dread owners. Unfortunately sometimes there is nothing you can do about it as the problem depends to a great extent on a type of hair. But cheer up, after about a year, in majority of cases, hair curls into a dread or rubs off. In other cases you can pull it into a dread with a crocheting needle. Some of the hair will try to escape after washing, but sooner or later the problem should disappear. A frequent method of getting rid of short hair is cutting it or even burning off – never ever do it – new hair will get out anyway and your dreads will be thinner and thinner. This problem may be solved by rolling dreads in one’s hands. It is also recommended to use special wax for dreads. Dreads may be done badly, they may get neglected, but with appropriate skills and experience, everything may be repaired. If you think there is no help for your dreads anymore contact me. Weaving of dreads is a natural process. Single hair curls in where it should not and after a while you can’t see where a given dread starts. The quickest and most painful method of solving this problem is to split them by catching two connected dreads and a strong flirt in two opposite directions. It is very efficient but very painful that is why the best method is to cut them – best if another person does it for us as it is difficult to see where to cut. Sometimes it is enough to cut a couple of hair and the dreads get loose on their own. Sometimes we get bored with a thickness of dreads we have. With thin dreads it is possible to connect them. Using a crocheting needle you can combine two dreads placed one to another. The initial effect of combining is not impressive, however after several months the border between dreads disappears and thin dreads become thick ones. There are many techniques of thickening dreads. They may be thickened with other dreads attached to the ones already made or though adding additional dreads on thinner strips of hair. The first method is less problematic. The second one demands thickening growing hair with the synthetic ones which is done best when dreads are created from a scratch. I do not recommend cutting previously made dreads in order to increase their volume. Cut dreads are weak and may easily fall. There are many ways of lengthening dreads. They may be lengthened with natural hair – purchased on a tape via Internet or in specialist hairstyling shops. The advantage of attached hair is a possibility of changing colour of the attached hair – it is natural so it keeps its natural properties, it is very soft and light. Its disadvantage is the high price. Another method of lengthening dreads is using synthetic hair, usually plastic one. Synthetic dreads mean here natural dreads lengthened with the artificial synthetic hair. At very short dreads the operation of lengthening is for many people a good solution as they don’t have to wait for the intended effect. Variety and high quality of synthetic hair makes it possible to match perfectly the colour to natural hair and also to introduce many modifications thanks to availability of various colours. Unfortunately in comparison with real hair they are very coarse, and after a dozen of months of wearing the colour fades. It is not so important in the event of dreads. What is important is that this kind of hair cannot be dyed. Another material used for this operation is a special type of wool. It may be dyed and it is much lighter than plastic hair. There are as many techniques of attaching hair as dread-makers. Some prefer sewing with a mere thread, I perform sewing with hair only. It gives more natural effect and thanks to using hair you cannot see the connection. Dreads may be lengthened to an unlimited length. Synthetic dreads may be taken off any moment. With the technique applied by me it lasts longer as except for taking off artificial dreads I also have to take out remains of hair from the places of connection and ends of natural dreads. Whether your dreads are made of own hair only or they are lengthened with the natural hair, the process of dyeing is almost the same. What is important is that dreads absorb a lot of colour and you need a lot more of it than usually. If in the past you used one packaging now you will need two and a half or even more. It is important to remember that dreads lengthened with synthetic plastic hair don’t get dyed. Dyeing helps dreads to get beaten down in the first stage of wearing them. Similarly as with dyeing amount of oxidiser needed to achieve the effect must be at least double. If you decide to oxidise your dreads, and before that you used different colours, be prepared for a long-term process full of surprises. Not always the colour covers evenly the hair in the dreads and oxidizing may give the effect of a mosaic. In this case the process of oxidizing must be repeated. At oxidizing the most important thing to remember is that dreads particularly the thin ones get worn off quicker and may fall off. After a year from oxidizing they get even thinner and a lot of hair from the dreads falls off. Before oxidizing, think twice if you really want this. You can always start to grow dreads from anew or have the short ones. This problem relates to several years old dreads. The most frequent reason for rubbing dreads through is wearing too tight rubber band. In the contact place the dreads get thinner and thinner and finally they fall off. A good solution is supplementing the rubbed through place with other hair (if you don’t dye your hair with the synthetic colours, but with the natural colours). The old school of making dreads says that real dreads cannot be combed out. Maybe true, but in my opinion the real dreads are 10-year old dreads and you can still argue with this theory. Dreads may be combed out. It is of course a time-consuming and rather painful process but feasible. The condition of your hair after combing it out depends on how long you have worn your dreads. After many years of wearing dreads and frequent curling the hair needs several months to recover and regain its normal structure so sometimes you need to cut the ends a bit. Some hair gets torn out during combing out however use of proper technique limits the amount to a necessary minimum. So don’t worry if you get bored with dreads does not mean you will need to shave your hair with a zero blade. There are many stories and legends circulating round dreads and condition of hair after cutting or combing the dreads out. One of the best known is that wearing dreads may lead to baldness. It is not true. Such stories occur probably because at some point men, due to their gens, start getting bald. If they also wear dreads, then it is easy to blame the hairstyle. I’m sure there are cases of people who lose hair due to dreads, but the reason of losing hair is incorrect or lack of any care, too frequent and too tight curling up. Inexpert curling up may be the reason of moving hair bulbs which may give the impression of getting bald. When dreads are thick and long they are also very heavy. Sometimes their weight widens the parting in the middle of one’s head – this problem may be solved by cutting a bit too long dreads. As mentioned above, condition of your hair depends on care and on appropriate diet. Whether we wear dreads or we have just cut them or we intend to make them does not affect directly the weakness of hair bulbs or hair itself.